Courtesy of Ned Denison, Cork Distance Week, Sandycove Island, Ireland. They came from all over the world and mostly arrived on Friday, July 7th to the seaside town of Kinsale in County Cork on the south coast of Ireland. The day was spent finding their pre-booked accommodations, meeting roommates, unpacking and getting in the first load of groceries. The clever ones got into the ocean that evening at Sandycove Island to take the shock off the cold acclimatization. The locals, the visiting veterans of previous years in Cork and those with big summer goals completed the first two-hour swim starting at 8 am on Saturday. The others came out early – looking for warmth. Introductions saw rounds of applause for Spain's Dani Lobo and New Zealand's Tracy Clark, visiting multi-year veterans who have returned as Triple Crowners. The one who summited Everest and the one going back the third time. You could hear a collective deep reality gulp as local swimmer Carol Cashell introduced herself and then departed immediately to the airport headed for Catalina. They endured the Torture Swim on Sunday and 11 Triple Crown swimmers were joined on Monday by 35 others for an intimate dinner celebration. Then on Sunday, August 13th, the English Channel successes started and ended with five crossings within 21 hours. A total of 146 alumni who have swum around Sandycove Island have completed a crossing of the English Channel. There are many more swims of the Cork Distance Week alumni coming after the first month. The towel (checked out by Trevor Malone in the photo above) was printed for 2017. 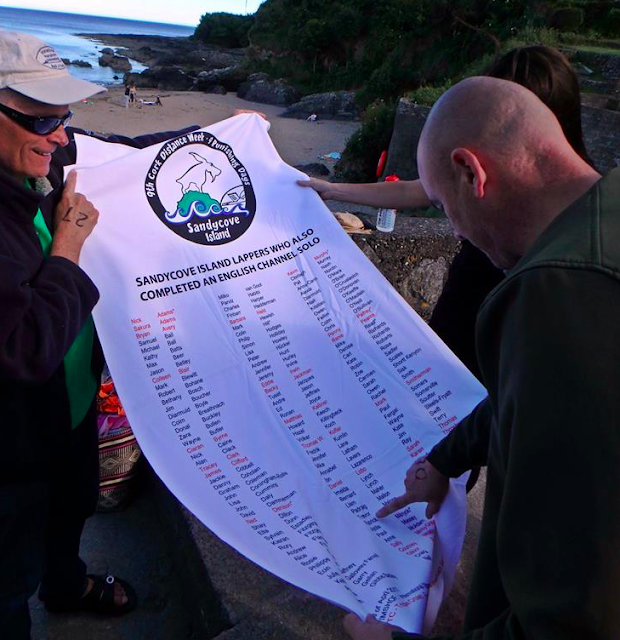 It looks like it might have to upgrade to a beach blanket in order to accommodate all the names for Cork Distance Week 2018.